This attractive apartment belongs to a beautiful old house with a total of 5 apartments. The house is well maintained and decorated with style, the characteristic details such as beamed ceilings and terracotta floors make this a pleasant place to be. The large swimming pool with sun beds, a table tennis table and a barbecue are shared with the other occupants. The spacious area is beautifully located in a natural surrounding with rolling hills. The cozy little village of Sasso Pisano is only 3 kilometers away, and you can get your daily groceries here but also enjoy a good meal. This village is also known for the magma that comes up to right underneath the earth's crust. The inhabitants are gratefully using it to generate energy. 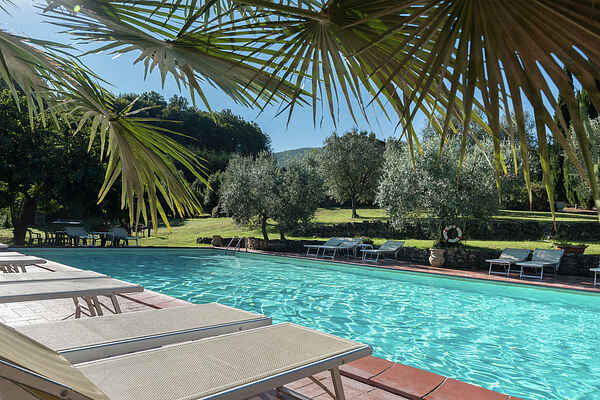 Podere Pisano Podere Pisano has a large enclosed garden of 2 hectares, where the children can play endlessly. There is a large pool (18 x 7:50 m, depth 1-2 m) with deck chairs and a ping pong table. The Fattoria is made up of 5 apartments. The apartments are neat and simply decorated in Tuscan style with wood-beamed ceilings and terracotta floors. BBQ joint. Wireless Internet access in the garden. On-site parking. Sasso Pisano In the center of Pisa, Siena and Grosseto there is this cozy Fattoria. Here you can enjoy the peace and nature of Tuscany and the many art treasures in the museums in the nearby towns such as Siena (60 km). In the museum of the Opera del Duomo to take an example is Duccio's famous Maestà. This painting nowadays consists of several separate parts since it was dismantled in 1711 and cut into pieces. The work has since been restored several times and the different parts are in museums around the world! A little closer is Massa Marittima (20 km). This city possesses one of the most beautiful cathedrals of Tuscany, the Romanesque-Gothic cathedral S. Cerbone. This church is 380 m high and well worth a visit! Sasso Pisano is also known for the hot magma located just below the surface where it generates energy. A day at the beach is possible. Follonica for example, is only at a 40 km distance. Supermarket, post office, bank and restaurants in Sasso Pisano (3 km). Just 3 Km in the village of Sasso Pisano, you can regenerate in the thermal waters of the new BIOLAKE opened in August 2013. It 'a swimming complex, intended to relaxation and well-being. It consists of a caldarium with water at 36 ° C and bath, a tepidarium, a pond purified phyto at ambient temperature. The swimming complex is fed by hot springs and the surrounding area from the cold waters heated by the geothermal district heating system. Retrieve and enhances the natural side of geothermal energy and its ancient use in bathing and hydrotherapy. The BIOLAKE resides in a place where you can still see the natural geothermal manifestations, in the vicinity of the paths fumaroles, Biancane of the park and the archaeological excavations of Etruscan-Roman thermal baths of Bagnone.